The depressed world shipbuilding industry has dragged down marine diesel engine industry since 2011, and the global output of marine diesel engine showed the CAGR of -17.4% between 2012 and 2016. As global shipping market began to rally over the past two years, the production of marine diesel engine revved up, reaching roughly 33.5 million horsepower in 2017 with a year-on-year increase of 7.0%. The world-renowned marine diesel engine manufacturers are mainly from South Korea, China and Japan. China produced 10.009 million kW (a third of the global total) marine diesel engines in 2017, up 2.2% on an annual basis, and showing production recovery in the country after a decline for five consecutive years. By product in China, output of low-speed marine diesel engines was around 5.791 million kW in 2017, occupying 57.9% of the country’s total marine diesel engine production; that of high-speed marine diesel engines remained at roughly 799,000 kW, with market share falling to 8.0% in 2017 from 26.7% in 2012 as it gets used less. 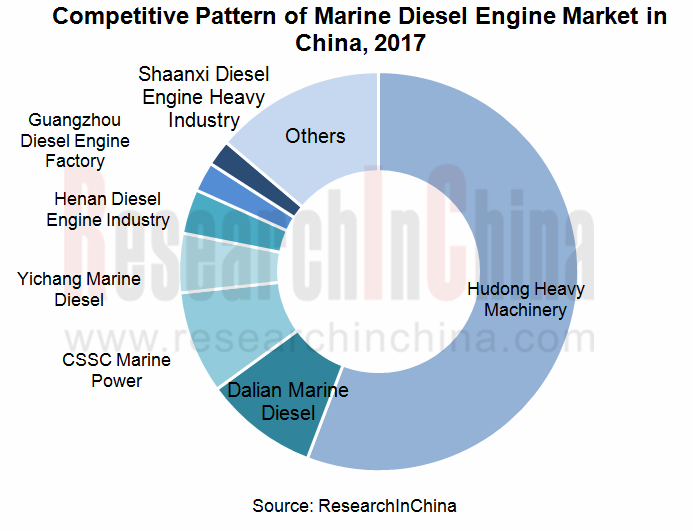 As concerns rivalry, Chinese marine diesel engine market is almost monopolized by affiliates of China State Shipbuilding Corporation Limited (CSSC) and China Shipbuilding Industry Corporation (CSIC). In the low-speed market, Hudong Heavy Machinery Co., Ltd. and Dalian Marine Diesel Co., Ltd. take a combined share of virtually 80%; in the medium-speed market, Weichai Heavy Machinery Co., Ltd., CSSC Marine Power Co., Ltd. and Hudong Heavy Machinery Co., Ltd. collectively accounted for over 70%. Currently, the global low-speed marine diesel engines are absolutely dominated by MAN, Wartsila, and Mitsubishi Heavy Industries; in medium-speed engine market, Wartsila, MAN, and Caterpillar held a combined market share of 86% (in 2017); high-speed engine brands include MTU, Deutz, MWM, SACM, Pielstick, Ruston, and Paxman. In China, marine diesel engines are mainly produced through patent licensing by MAN, Wartsila and MTU. 1. Green and environment-friendly diesel engines: To reduce pollutants to the air and meet increasingly stringent emission standards, companies at home and abroad are vigorously developing marine diesel engines in line with Tier III standards. Second, dual-fuel marine diesel engines: Amid the oil crisis and the deteriorating environmental pollution, the shipbuilding industry needs to find alternative energy sources for engines. Since 2017,Wartsila, Anqing CSSC Marine Diesel Co., Ltd. and other companies have developed dual-fuel low-speed marine diesel engines; MAN has signed a Memorandum of Understanding (MoU) with Hyundai Heavy Industries Engine & Machinery Division (HHI-EMD) on the development and production of MAN B&W ME-LGIP dual-fuel engines in 2018. 7.1.3 Major Subsidiary -- CSSC-MES Diesel Co., Ltd.
7.1.4 Major Subsidiary -- China Shipbuilding Power Engineering Institute Co. Ltd.
7.6.3 Subsidiary -- Anqing CSSC Marine Diesel Co., Ltd.
7.9.1 Jiangsu Antai Power Machinery Co., Ltd.
7.9.2 Shanghai Xinzhong Power Machine Co., Ltd.
7.9.3 Hefei RongAn Power Machinery Co., Ltd.
7.9.4 ZGPT Diesel Heavy Industry Co. Ltd.
7.9.5 Ningbo C.S.I. Power & Machinery Group Co., Ltd.
7.9.6 ZhongJi Hitachi Zosen Diesel Engine Co., Ltd.
7.9.7 Yuchai Marine Power Co., Ltd.
7.9.8 Sichuan CRRC Yuchai Engine Co., Ltd.